Description: Here comes the Easter Bunny with a large square wooden cart for you to put Easter Eggs into. 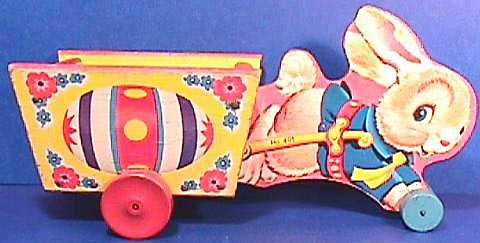 FPT4177 - Wooden cut-out bunny with a square wooden cart on the back. The bunny has paper lithographs on the sides of a bunny in a running position dressed in a blue jacket and yellow tie. Bunny has big blue eyes and a red harness around his waist with yellow cart handle on the sides (handle is marked, "401"). The bunny's back feet are pressed against the cart. The cart paper lithographs on the sides of a huge Easter Egg with flowers on the 4 corners. The egg has a pink stripe in the center with yellow dots and white, blue, and purple stripes on the sides with pink star shapes on the end. This toy rolls on 4 wooden wheels: 2 under the cart and 2 attached to bunny's front paws. Measures 10" long. 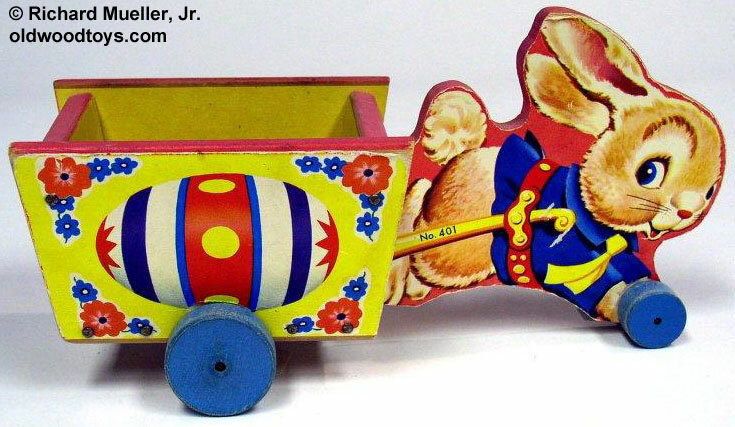 Also see 1957-1957's #304 Running Bunny Cart for this bunny pulling a blue wicker-simulated basket. Also see 1957-1957's #303 Bunny Push Cart with wheels on bunny's back wheels and front paws against the cart. Also see 1958-1959's #311 Running Bunny Cart for a cart that is identical to that #401 Bunny Cart.